Watford have made Uruguayan defender Miguel Britos and attacking midfielder Jose Jurado their latest signings. Britos, 30, arrives from Serie A side Napoli on a three-year deal. Former Atletico Madrid player Jurado, 29, comes in from Spartak Moscow, also on a three-year contract. The Spaniard, who was an Atletico player under current Watford head coach Quique Sanchez Flores, has also played for Schalke, Mallorca and started his career at Real Madrid. 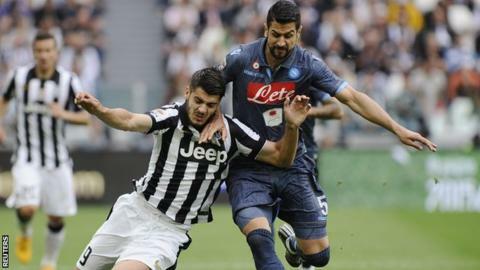 Former Bologna centre-back Britos was twice a Coppa Italia winner with Napoli but was sent off in his final appearance for the club in May after headbutting Juventus' Alvaro Morata.